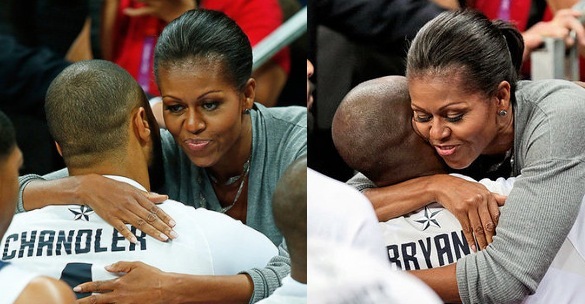 The cutest thing you’ll ever see besides kittens on YouTube has to be pictures of Michelle Obama hugging the men’s basketball team at the 2012 Olympics. 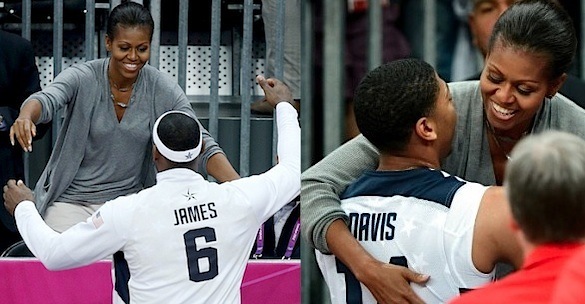 If we’re judging Michelle’s favoritism based on how big she smiled for each player – LeBron James wins. She looked the least happy to be embracing the Knicks’ Tyson Chandler but the boredom left her face when Kobe and LeBron approached her on Sunday after beating France in the preliminaries. Pictures of her with Oregon-native Kevin Love don’t seem to exist (for a second I thought Barack had turned her into an un-American Muslim) but it did happen. There’s a video! The day before, Michelle sat with Venus Williams and her mother as Serena beat Jelena Jankovic and gave them equally wonderful first lady bearhugs. Serena told USA Today that Mrs. Obama is “cool” and that they’re on a first-name basis. I can’t wait till we get ethics back into the White House instead of this Black Couple spending all of the US’s money that we are in debt to China to. Romeny 12″ We need change!